I love Spring… especially when it feels like Spring. While I could stand for the weather to warm up a bit more than it has, I’m soaking up the fresh flowers, colors and flavors that accompany the season. 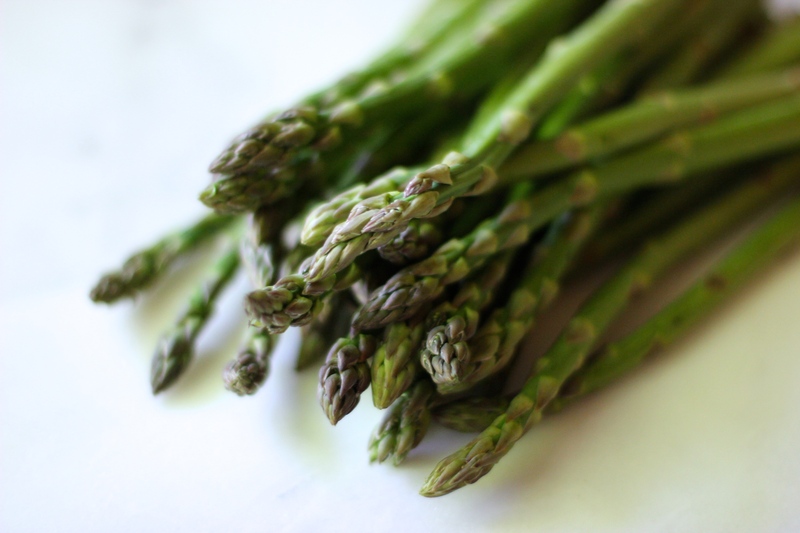 As much as I love most seasonal Spring produce, I’ve never been a huge asparagus person. I don’t have an aversion to it and do enjoy it on occasion, but I’ve also never experienced a craving for it, nor have I gravitated towards asparagus over other vegetable options when perusing a restaurant menu. I recently realized that my lack of enthusiasm for asparagus is a direct result of the fact that I’ve simply been eating it wrong. And by wrong, I mean cooked. Raw asparagus, my friends, is an entirely different ball game. It’s crisp, flavorful, and the slightest bit sweet compared to its temperature-modified counterpart, and makes for a delightful addition (or base) of just about any Spring salad. 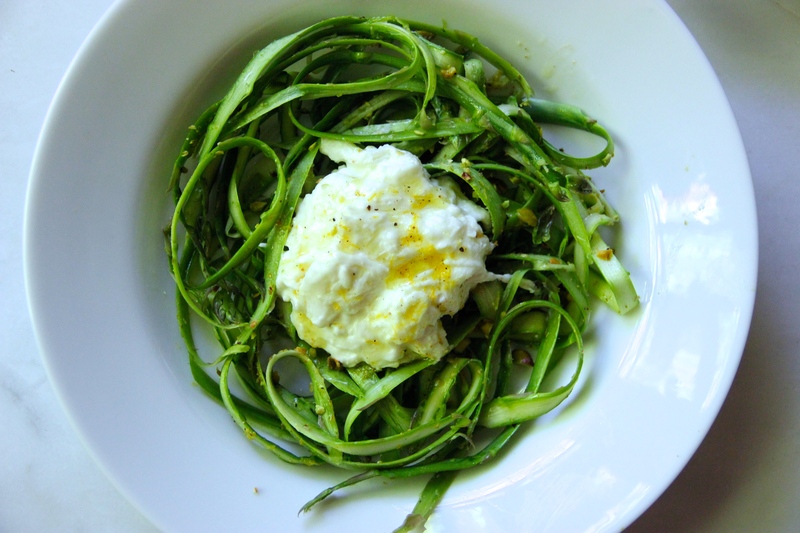 In an effort to create a salad whose flavor profile effectively highlighted the raw asparagus without overpowering the accompanying ingredients, I used a vegetable peeler to shave the spears into delicate ribbons. 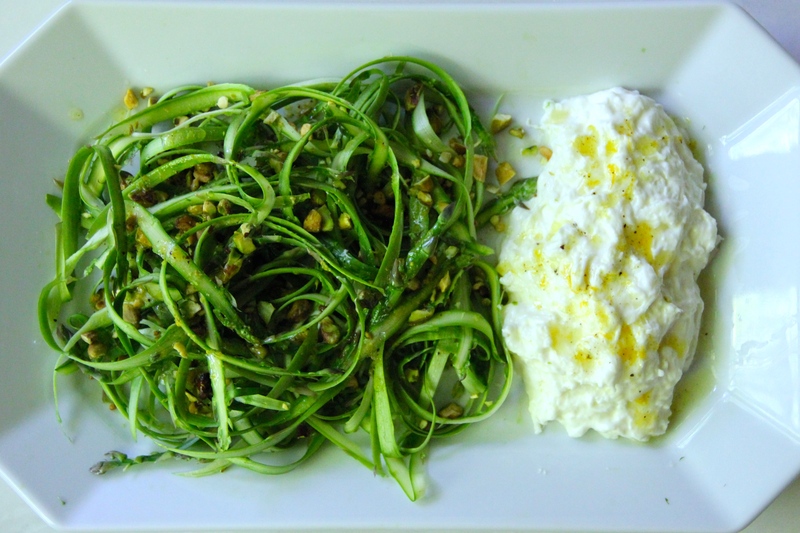 Pairing the asparagus ribbons with roasted pistachios and fresh burrata added a crunch as well as a creamy texture, both of which paired perfectly with a drizzle of fresh lemon and olive oil with mild seasonings. Happy Spring, and bon appétit! Using a vegetable peeler, create asparagus ribbons peeling from the base to the tip (you do not need to break off the base, but hold the asparagus by the base and begin peeling about an inch up). 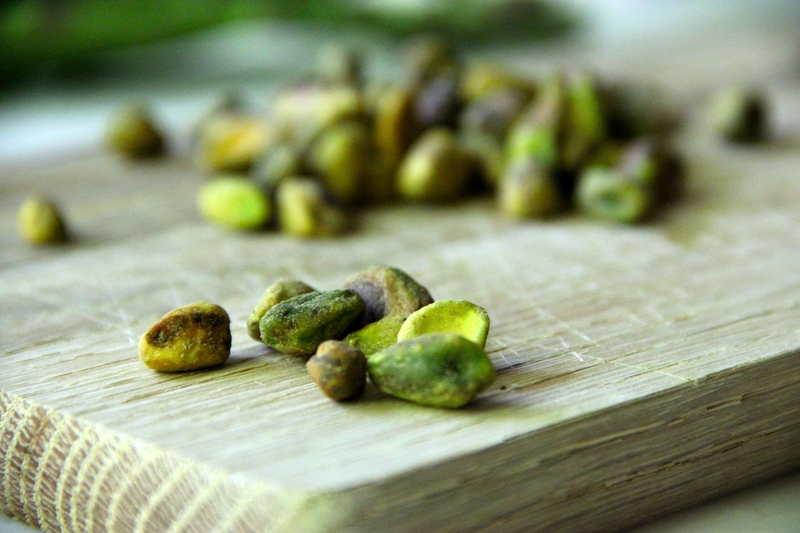 Using a large sharp knife, coarsely chop the pistachios and set aside. Using a grater, grate the peel of 1 lemon into a bowl. Add the juice of 1 lemon, the olive oil, salt and pepper. Whisk thoroughly and taste, adding juice from the 2nd lemon if desired. 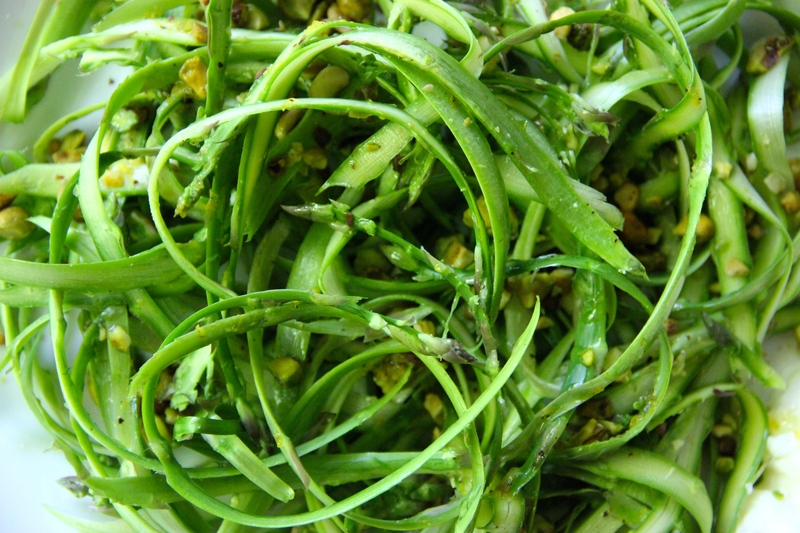 Arrange the asparagus ribbons on a plate, and sprinkle with pistachios. Drizzle the lemon and olive oil dressing over the top, one teaspoon at a time (you will have some left over). 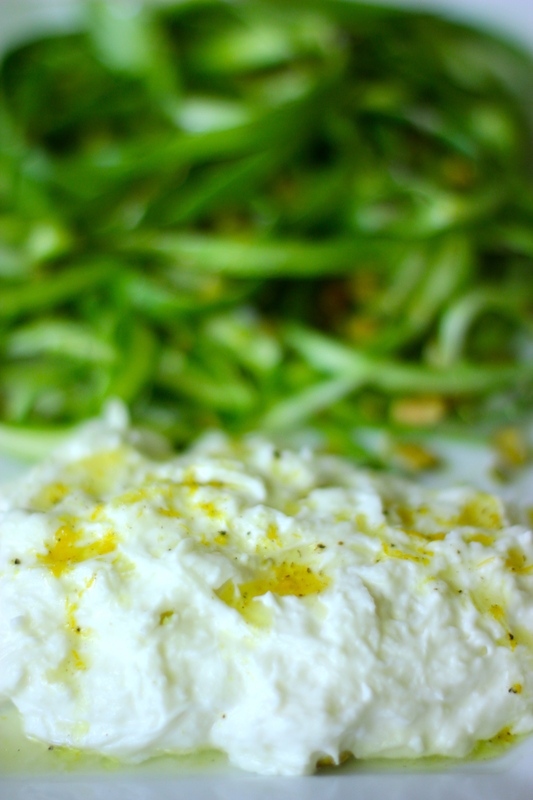 Place the Burrata as desired, either alongside the asparagus or on top (hint: I removed the skin of the cheese).